May I suggest the following method. Arms remain comfortably bent and blades feathered during the recovery. As your body stops against your knees the momentum of the moving blades straightens your arms. When this happens square the blades. and at full stretch of the arms drop the spoons in the water. The rebounding arms and body very quickly get the spoon to water speed and allow a quick, clean entry. You might like to also try the early layback technique. While the spoon is entering the water pivot your body ABOVE the hips by moving the seat closer to your feet as your shoulders move towards the bow. Now when you build the work your upper bodyweight will reduce rather than increase the load on the back. This will also give you a longer leg drive. 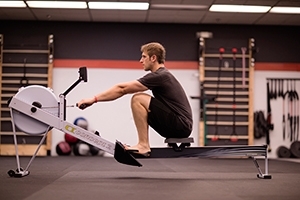 Both these techniques will work on the erg.